Give your pizza an easy little delicious twist! Everyone loves pizza! It never goes out of style and you can come up with the most ingenious and crazy topping combinations (though Italian people will frown upon you if you dare to use pineapple). But sometimes you just want something different than the regular old flat pie. Change things up a bit with an easy twist to get delicious handfuls that are perfect for sharing! 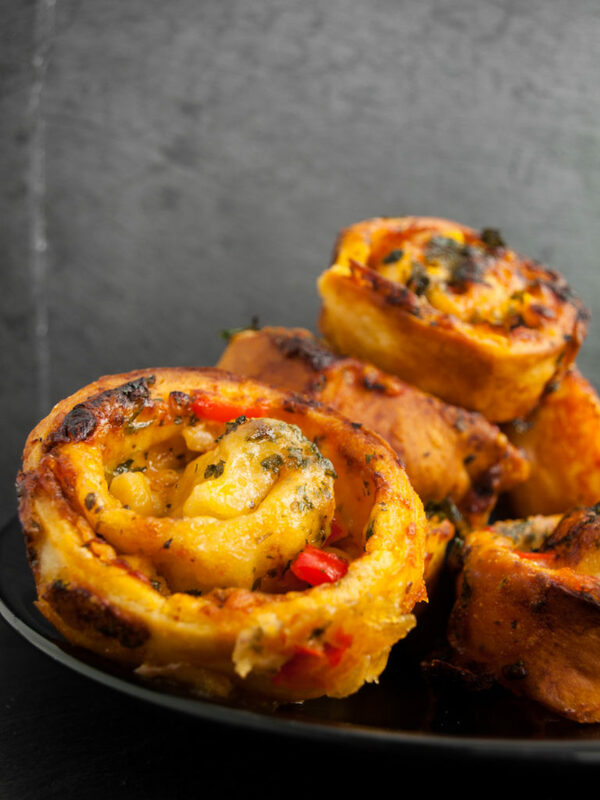 By rolling up the pizza and slicing it, you’ll end up with tasty portion-sized pizza rolls that are awesome finger-food for a party and a great addition to any brunch or pot-luck. The process is ridiculously easy, you just roll out your pizza and top it with delicious things as you would normally do, but then you roll it up again to get a big ol’ pizza log! Chill the log for half an hour then slice it up into small little pizza rolls. Bake them, take a bite and try to get that smile off your face! There are 3 ways you can bake the pizza rolls, all of them are fun and delicious. You simply place them on a baking sheet. Perfect individual rolls – No questions asked. The third version is my personal favorite! The fat from the cheese oozes out and the sides of your pizza muffins get all crisp and delicious. If you don’t have enough muffin tins for all your rolls, just use the first way as well and place the remaining rolls on a baking sheet. Everyone loves variety on a place! For some extra deliciousness and a perfect golden finish of your rolls, brush them with herbed garlic butter and Parmesan cheese. For this melt 30 grams of butter, add 2 tablespoons chopped parsley, 1 tablespoon chopped garlic and 2 tablespoon grated Parmesan cheese. Mix to combine and brush on your pizza rolls before baking. I decided that I want to be vegetarian for a month! The main reason behind it is to broaden my repertoire with some more veggie recipes. So I made these pizza rolls underneath with sweet potato, gorgonzola, mozzarella and pecan nuts. 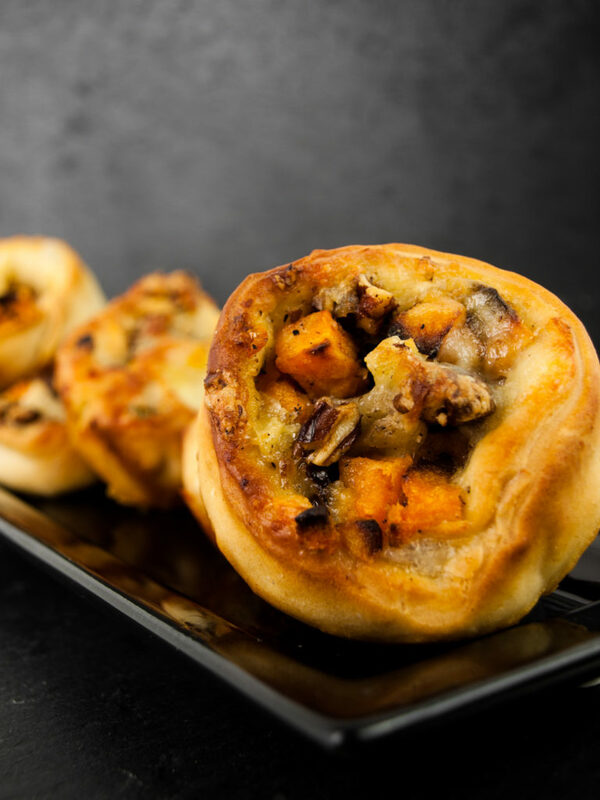 Vegetarian pizza rolls filled with roasted sweet-potato cubes, gorgonzola, mozzarella and pecan nuts! A really good combination! + everything you ever wanted to put on a pizza! Roll out your pizza dough and cover with the thick tomato sauce. Sprinkle with the grated cheese. The cheese will act as your glue so make sure everything is covered. Put your favorite toppings onto the pizza. It works best if you cut everything into small little cubes. Roll up your pizza tightly from the long side, so that you get a snug long thick log. Place in pizza log in the fridge for 30 minutes. Don’t skip this, it will make slicing so much easier! While the pizza log chills, preheat your oven to 220°c (fan works best for a crunchy pizza crust). Using a sharp knife cut the chilled pizza log into about 2cm wide slices. Place the slices on a baking tray lined with parchment paper or put the rolls into muffin tins. Optional: Brush the pizza rolls with the melted herbed butter for an extra delicious golden finish golden. Bake for 12-15 minutes in the pre-heated oven. You have more than a dozen small little delicious pizza rolls, share ‘em already with your loved ones! What is your favorite thing to put on a pizza?? Cheese, cheese and some more cheese? As I’m currently eating only vegetarian, help me out and give me some inspiration for topping combinations! Let’s create the best veggie pizza ever! Next Post Being vegetarian for a month is challenging but fun!